Perhaps when you were younger you had some plastic dinosaurs -bags and bags of dinos that your parents bought cheaplyat the grocery, local five-and-dime, or nearest museum storeThe multi-colored dinos battled and endured all sorts of abuse in the sandand the schoolyards.Ultimately they were burned by fireworks, or chewed by dogs, but you probablystill remember all the wonderfull battles and the names.If you were like me, you never mixed the cretaceous, the jurassic (and heaven forbid! 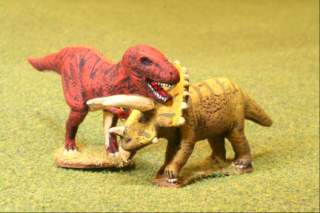 )the triassic dinos.And you were a loser if you thought the Paleozoic creatures somehow mixed in with theMesozoics. Do you really think an Allosaurus bit the back of a Dimetrodon? To the right, a photo of Dave circa 1971. 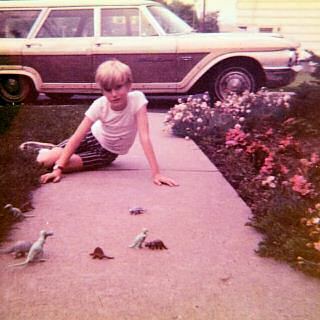 My family's Ford Country Squire station wagon in the background.I love how a family wagon had those sleek aero wheel wells in the back.Or course the simulated wood panels are nostalgic. Well, that's a big preamble to some of the nice dino models that you can get these days.On a whim, I bought a few and painted them up.In those days, I would have slapped a single coat of Testor's enamel in strong saturated colorsand be done.Brown for brontosaurus. Red for tyranosaurus. Green for Allosaurus.These days, time starved, I slapped a couple of dry-brushed coats on them. And I took the liberty ofbeing a litle more adventurous with the colors.Stripes! 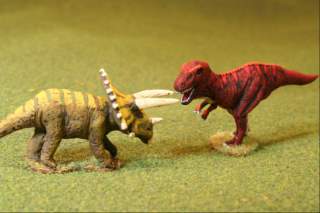 A Tyranosaurus Rex finds a lone Tricerotops in the middle of a field. 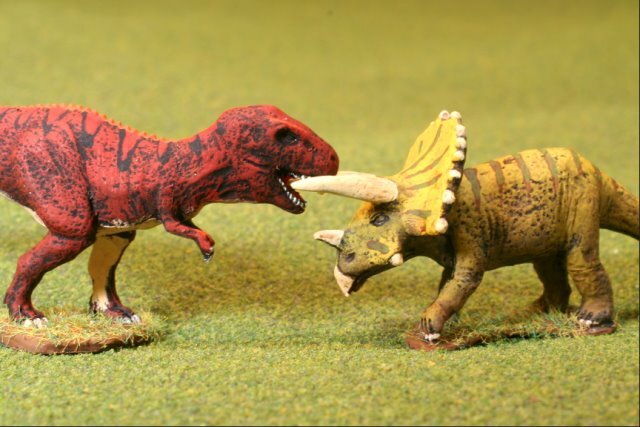 The Tyranosaurus attacks. The Tyranosaurus circles the Tricerotops, but gets nothing but a mouthful of horns. 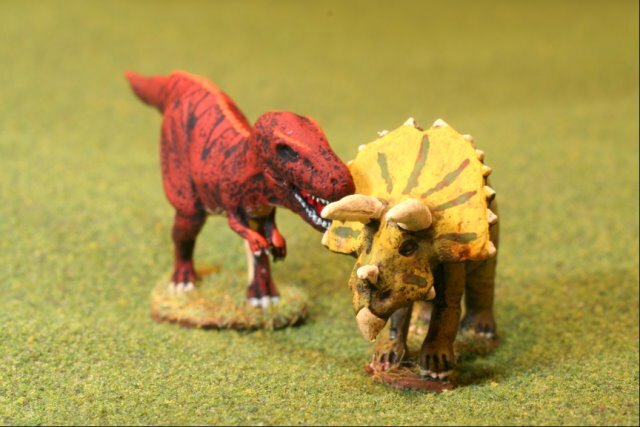 Again the Tyranosaurus bites, but this time gets nothing but a boney crown. They push. They fight. How will the battle end? Dinosaurs are Magister Militum.Paints are Vallejo acrylics and Testor's Dullcote.Paint job is courtesy of a rainy Sunday afternoon in Austin. Last modified: Thursday, 09-Jun-2011 12:54:46 MST.